Let’s all assume for a minute that Florida State’s QB Jameis Winston is selected as the first overall selection of the 2015 NFL Draft by the Tampa Bay Buccaneers. Allow this scenario to soak into your bones Duck fans as there are three possible teams that could select the Hawaiian product with the second pick. The Tennessee Titans and Chicago Bears are teams that need the services of Marcus Mariota come the 2015 football season. Their selection of QB Jake Locker out of the University of Washington never really took flight, as he didn’t perform to the level at which he was expected to play. Locker is not a franchise QB and has not displayed the slightest hope that he could be one eventually. Having Mariota step into the picture will not only give the Titans a possible franchise QB, but also an opportunity to move on and start over. 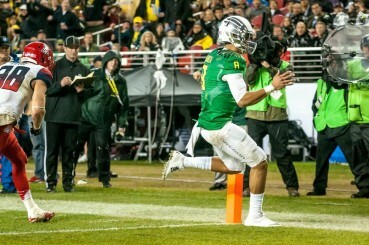 Mariota rushing into the end zone for the TD. The Bears are in a very sticky situation to say the least. When the organization signed “franchise quarterback” Jay Cutler to a seven-year, $126.7 million contract prior to the 2014 season, Cutler decided to demonstrate his love for the team by throwing 18 interceptions and having six fumbles. Since then, numerous reports and rumors have been swirling throughout the NFL regarding the chance of the Bears trading Cutler to another team. With general manager Ryan Pace and head John Fox leading the Bears’ organization, there’s no doubt that their analyzing scenarios will push their draft stock up from the seventh pick. Watching what Fox accomplished with QB Peyton Manning in Denver was something that is rarely seen in the NFL. If Mariota went to the Windy City, he would have a golden opportunity to achieve some accolades with Fox’s offensive system. Also, say by some miraculous chance Mariota falls to the seventh pick, the Bears would have an opportunity to watch both him and Cutler battle each other out during training camp and pre-season games. They would then go forward to decide the starting QB for day one of the 2015 season.